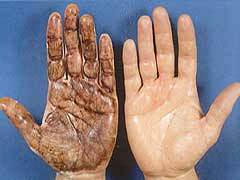 Most often a dermatologist is contacted based on hyperhidrosis palmoplantaris (hand/foot sweat.) 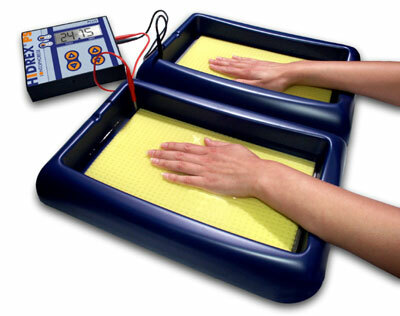 There is a reliable and tested treatment, since the introduction of tap water-iontophorese by Levit in 1968, available.There are very soft direct currents, which are transmitted through the skin of the surface of the hand and the sole by means of hydro-electrical bathes. Hands and feet are put into a plastic tub, which is filled with tap water. The tub has electrodes, which are covered by isolated towels. The electrodes are connected by cable to a power generator, which serves as a direct current.Because of the direct current –possibly because of a functional inhibition of the cells of the sweat glands - approximately after ten or fifteen minutes of successions of treatments a normal (normhidrosis) non-pathological stage should be reached. 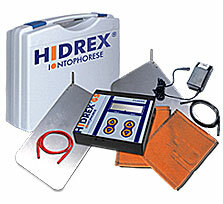 The iontophorese is therefore a proven highly effective treatment against hyperhidrosis. In order to keep the normal stage a continues treatment is required, which must be performed one or two times a week.In this case your doctor might issue a prescription for this device.